A few years ago, in one of their various flash-in-the-pan DC lines, Mattel gave us a Dark Knight Returns Batman. Now they're finally giving us a Superman to go with him. Dark Knight Returns is one of the books that transitioned comics out of the Bronze Age and into... well, either the Dark Age (if you think that subsequent Age is over) or the Iron Age (if you don't). It inspired a lot of really grim and gritty stories to come after, and it fundamentally changed the dynamic between Superman and Batman. Before Dark Knight Returns, the two heroes had always been the best of buds. Frank Miller was the first to cast them as opposing forces, and that's the way it's been ever since. Now, instead of unquestioning partners who you could see gardening or going fishing or playing tennis together, they're distant and distrustful. There's respect, but not friendship, and it's all because of one book. The figure's head definitely looks like a Frank Miller drawing, but if you really go back and look at Dark Knight Returns, this isn't how Frank drew him: there, Superman was full and fresh-faced, not the decrepit wreck we think of thanks to years of bad fan-art and homages. This sort of splits the difference, with prominent cheekbones and just a few wrinkles so we can remember what it's supposed to represent. Also, they did a great job with his ridiculous spit-curl. 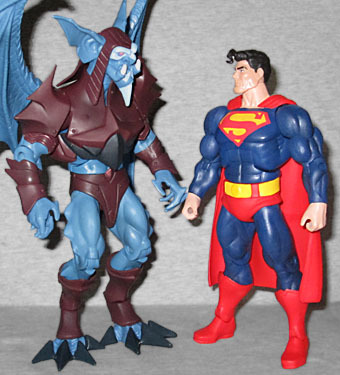 As they did with Batman, Mattel has chosen to suggest Frank Miller's chunky artwork by using a MotU Classics body to create Superman. 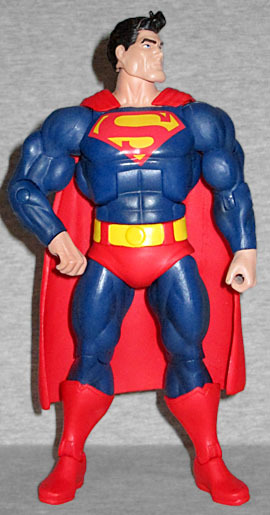 The new parts (in addition to the head, of course) are limited to the shins, the underpants, and the cape - in other words, all the things that would be unique to Superman that a He-Man figure couldn't provide. The boots have a sculpted line and that little triangular cutout at the top; his trunks have the wide belt with the circular buckle in the center; and his cape appears to emerge directly from his collar. The chest is definitely the same Batman got, with a very shallow sternal notch that keeps it looking like a shirt rather than painted skin. Speaking of paint, what we get is not complex, but it suits the source material well. Dark Knight Returns had very moody color, but it was still fairly flat (it was the '80s, after all). 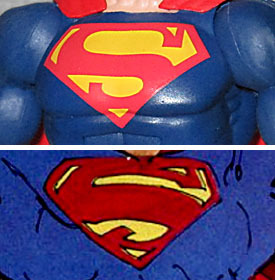 Supes is a solid dark blue, with bright red for the boots, cape and trunks. The yellow of his belt is painted over the red plastic, but it's not as crisp as it could be - the edges are rounded, rather than straight. There's no symbol on the back of his cape, because Frank only drew one there about half the time. What's disappointing, though, is that the shape of the toy's S doesn't match the art from the comic. 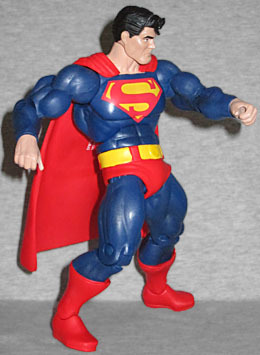 Years back, DC Direct made a Dark Knight Returns Superman figure, and they re-released it a few weeks ago, but it's hardly any surprise that this figure at least has the edge in articulation. MotU Classics may not be great, but neither are they below average. Superman has a balljointed neck, peg/hinge shoulders, peg biceps, hinge elbows, peg wrists, torso hinge, balljointed hips, peg thighs, hinge knees, peg boot tops and hinge elbows. Since the cape is stiff plastic, it will point straight out in the air if you bend him over, which might actually work decently for faking flight. Unlike the vast majority of Superman figures, this one come with an accessory. It's not much - just the Kryptonite arrow Ollie shoots at (30-year-old spoiler warning) him - but it's better than nothing. Barely. It's both too small for the toy to hold in its hand, and too small to be an arrow fired by an adult human being, but Mattel has a history of getting that wrong. It also has four fletches, rather than the correct three. In the original pitch, Bruce sprayed the Kryptonite out of his armor, but using Green Arrow to deliver it adds depth to the story. And gets us an accessory. It's no secret that Dark Knight Returns was written because of Frank Miller's fear of his own aging; he says so himself in the foreward to the TPB. But if you read the story with that in mind, it becomes clear that while Batman is Frank's stand-in for himself, Superman represents Batman - that is, the concept, not the character. Bruce (Frank) is considered over-the-hill by everyone around him, but feels like he still has something to contribute; Superman (Batman) is perpetually perfect and ageless, but sacrifices limitless potential to mortal masters in DC who force him to play it safe and follow the rules, and only allow him to operate (get published) as long as he doesn't rock the boat too much. Superman wants Batman to stop, because he's too old and too crazy and the public resents him; "Batman" wants Frank to stop, because he's too old and too crazy and the audience doesn't want his ideas. Plus, whether it's a Russian nuke or Batman Forever, they're both capable of surviving horrific destruction. So you have to ask, does that mean Frank Miller resents the idea of Batman the way Batman resents Superman? Actually, knowing what Frank Miller became over the years, it's weird to think that the villain of the piece is the one who's kowtowing to the government - specifically, to Ronald Reagan. It'd be like going back and finding an Alan Moore story that was all about how great it is to let Hollywood license your ideas. 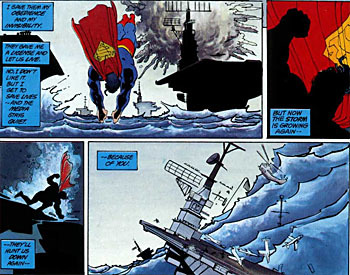 But still, Dark Knight Returns is an undeniable classic, and it's great that Mattel took the opportunity of its anniversary (and the pending movie, of course) to bring us Frank Miller's Superman.